Think about our world. Problems. There are problems everywhere. But, isn’t that life, folks? Isn’t like about dealing with problems. Problems: not enough money, not enough time, not enough health, not enough patience, not enough gas in our tanks to enjoy life…instead…we just endure it. Is that what God intended? Just endure this life? Surely there’s more. I believe there is. Jesus said, “I am come that you may have an abundant life and live it to the full” (John 10:10). What does, “abundant” mean? According to http://www.blueletterbible.org it means: “exceeding some number or measure or rank or need.” I’m glad of that! Jesus wants to give us a life on this earth…yes…a sin-filled earth that exceeds measure and need. That’s good! That means that even in this crazy world, we can enjoy the journey. Even with the debates about immigrants and refugees…we can enjoy the journey. Even though work may not be perfect, your health may not be perfect, your kids may not be perfect, you and I can still “exceed some number, or measure or rank or need.” I don’t know about you, but that comforts me! Music is a powerful thing. Music has been a part of my life for as long and as far back as I can remember. I remember sitting in Dad’s car as a little girl and listening to classical music. He always said it made a person smarter. I remember my first piano lesson and how I hated it and Mama telling me that I would learn an instrument and learn it well so I had better find one that I liked and stick with it (it wasn’t the piano) 😃 I remember Daddy would sometimes pull out his old tape of instrumentals composed by Michael W. Smith and he would have us close our eyes and try to imagine seeing heaven for the first time. I remember singing my first solo at church when I was about 6 years old. And from the time that I was about 4 or 5 until I was 14 Mama and Daddy would sing a hymn to me before bed every single night. One of my earliest memories of actually feeling the Lord’s presence in my life very much involved music… I was about 5 or 6 and we were singing the song “Shout To The Lord” one Sunday morning at church. We always showed a video during the song of different things in nature…. One of the things on the video was waves crashing in the ocean. I remember standing there, singing along, and when the waves part of the video came on the screen I felt the Lord speak into my spirit and say “Do you see that? I made that. And this music. Those notes that make up this song? I made that too.” I came home from church that day and told Mama that when we sang “Shout To The Lord” I felt Jesus. That’s the especially beautiful thing about music. Still to this day when I hear those songs by Michael W. Smith I remember thinking about heaven. Or when I hear certain hymns I think about being little and the feeling of peace, safety and contentment I felt as I laid in my bed, in my little pink bedroom, with Mama and Daddy sitting on both sides of me singing those old songs with such rich and meaningful lyrics. Music has a way of embedding itself in our minds and bringing back memories, thoughts and feelings…. and for me, it has and always will be a source of peace and comfort. I have this thing that I do when I’m feeling afraid or overwhelmed. I sing. I usually sing a hymn or a worship song and I’ll sing it until the feeling passes. After the car accident I was in back in December I had dreams about it for about 3 weeks. Almost every single night I would wake up in a sweat after dreaming about the crash in slow motion over and over again. Every night that I had a dream about it I would turn on my light and sing “It Is Well With My Soul” or “Tis So Sweet To Trust In Jesus” and slowly, but surely the fear would dissipate and I would go back to sleep. I love when I’m onstage on a Sunday morning or Wednesday night and I close my eyes during a song and listen to all of the voices around me. I love that God is using something so near and dear to my heart to bring people closer to Him. I love when people say that something I have sung or played has made them feel the presence of Jesus in their lives. There is nothing else like it. I am so thankful for the power that music carries. It has brought me out of many a dark place. I encourage you, the next time you’re at church, to close your eyes during one of the songs and just listen to the voices around you. It truly is a powerful thing. Pretty good, huh? I’ll say so! And if I might brag (albeit humbly) on her a little more… Check out this song she wrote herself. Well, the upshot is this: our kids will rise to our level of expectations and that’s true of their spiritual lives. I know we all have goals of what we want our kids to do academically and vocationally and even athletically, but what about spiritually? Caleb’s devotion addresses that very well. Here’s some pictures from of our Sportsmen’s Banquet last week. We had over 400 folks come and participate. Do we love our community at MPBC? You better believe it! 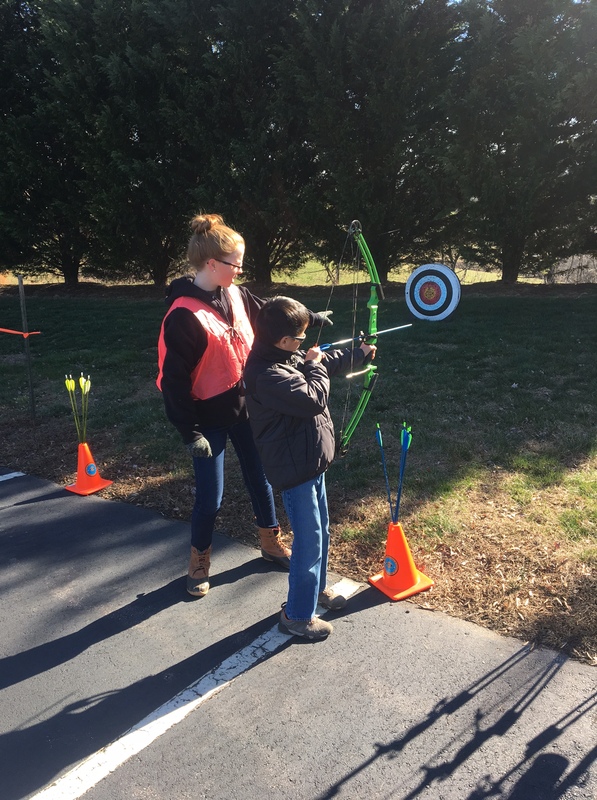 Here’s Amanda Eddins helping Andrew shoot a bow. Amanda is an amazing teacher and she is quite a markslady herself! Don’t you just love that picture. 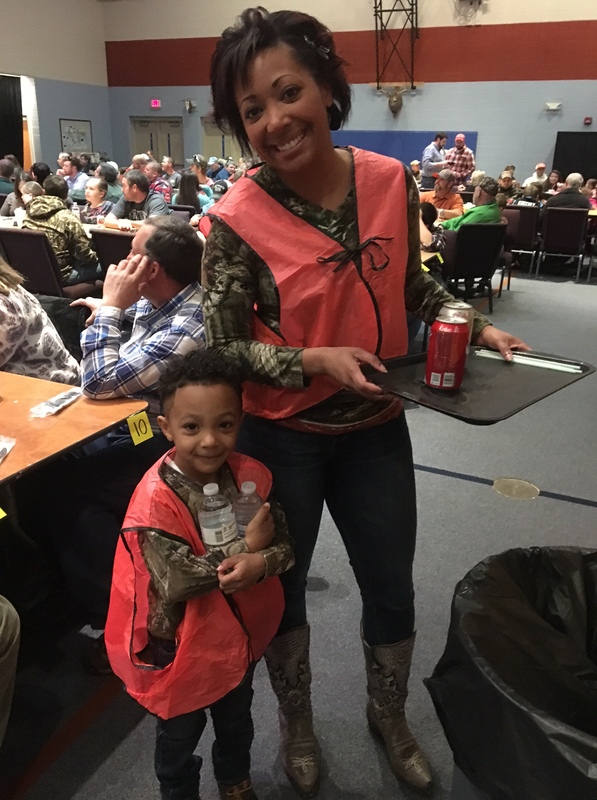 Desi and her son, Jace taking care of making sure all our folks had plenty of soft drinks and water! 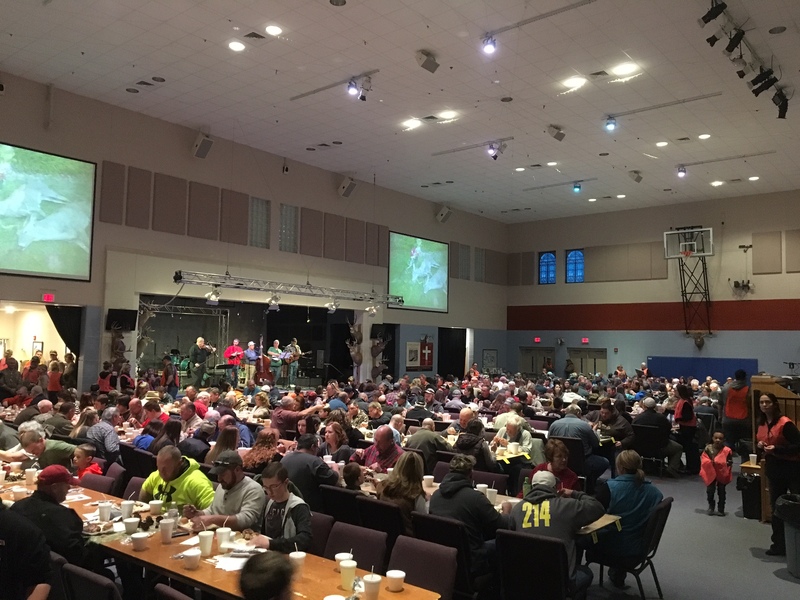 Yes, we love our community and gave them a wonderful meal, music and most importantly, Jesus! And you see, that’s important. We’ve got to give people help in one hand…but, Jesus in the other and a lot of churches are moving away from that. Today, they only offer the “social gospel.” Just feed people and that’s it. Well, if that’s all you do and that person dies without Jesus, they’ll go to hell with a full belly, but what have we really accomplished? Give ’em food and clothes and love…but, for Pete’s sake…give them Jesus! People are asking me: “Is winter over?” Well, it’s certainly been an anemic winter if you like snow. What a roller coaster. From low 40’s for highs to mid-70’s within just a few days. It was a high of 43 yesterday and Sunday it’s supposed to be 74! Is that crazy or what?